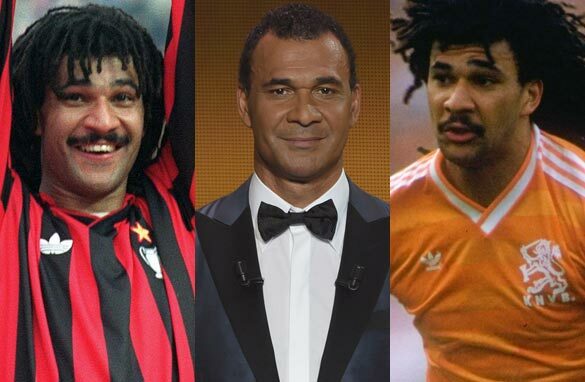 CNN Football Club: Ruud Gullit answers your questions! Ruud Gullit (right), this week's guest on CNN FC, won back-to-back European titles with AC Milan. (Getty Images). A European champion with club and country who was once crowned the continent’s finest player, Ruud Gullit’s pedigree in unquestionable. Now the midfielder is adding the CNN Football Club to a CV which already boasts AC Milan, Sampdoria and Chelsea. The mercurial Dutchman was in the studio to assess this week’s European Champions League quarterfinal ties, a competition he won twice as a player. In fact, Gullit’s AC Milan team which lifted club football’s most prestigious trophy in 1989 and 1990 was the last to successfully defend the title. And that is the subject of our latest poll, which this week asks the questions is the modern Champions League harder to win than the old European Cup? Former Netherlands captain Gullit, who was capped over 50 times for his country before embarking on a managerial career which has seen him take charge of Chelsea, Newcastle United and Los Angeles Galaxy, also faced your questions as the CNN Football Club put him On the Spot. How did it feel to lift the Netherlands’ first and only major trophy? What was it like to play alongside Frank Rijkaard and Marco van Basten for club and country? Can any current team match Milan’s achievement and win the Champions League in consecutive seasons? Vote in the poll above and don’t forget to tune in to the CNN Football Club on CNN International at 1700 GMT on Thursdays. You can also have your say by following our @CNNFC Twitter account or visiting the show’s Facebook page. Who according to you is the best Central Defensive Midfielder and the best Center Back at the moment? Will the Dutch squad EVER actually win the World Cup? Will he come back to management anytime soon? Why you leave AC Milan Rudd??? Why don't you come back to Italy? You can either work in the sport field, but if you want to try with the Parliament as well I will support you! who is your best coach and player in the globe? Are you considering a return to coaching? If so, have you contemplated a move back to AC Milan, as such. It would most definitely be highly welcomed by all AC Milan fans out there. Why didn't auction your dreadlockcs on google? You have recently met Bhaichung Bhutia in Sikkim, India. If you have seen him play , do you think that with his calibre, he could have played in any of the european leagues ? As a player, would you rather play in oppressive heat and humidity or freezing wet rain and why? What was wrong with the national team in the 1990 worldcup? What is one regret you have had as a player or a manager in your career? when are you coming back to football management? I have been a fan of yours right from your days with AC Milan and Holland especially when you won the European championship with Holland. I would want to know which club you are managing now an if no club when are you coming back to managing a club or have you given up management? Do you think ronaldo deserves fifa player of the year? Ruud used to be a fine footballer and leader of men on and off the field. I have watched Ruud on the BBC as Pundit with Gary Linekar and his boys. Ruud's comments are always balanced and constructive. The Flying Dutchman is never rude. Throughout your long career as a football player, who was in your opinion the best player you ever played against? I've always been a big fan of yours. Pure class on and off the pitch. Here's my quesiton: in your opinion, what would the FIFA / UEFA do if they discover that a superstar like Messi and Ronaldo has failed a doping test? What do you think they should do?